Recipes, like birds, know no borders. Beetroot. Beta vulgaris. Hmm. And borscht. Are you picturing what I am picturing? A weathered babushka – with a babushka – ladling steaming red soup into a tin bowl? I have that image from actual memory. Not a Grimm’s fairy tale story read to me by my mother on a howling night, but a real live babushka: brown walnut face shyly smiling as she proudly served her national soup to me, a dangerous visitor from the land of Ronald Reagan and Mickey Mouse. It was 1985 and I was visiting the USSR with a disparate group of fellow students and older travellers. Instead of going home to Florida and getting some much needed Vitamin D and a fix of Southern food (fried chicken, sweet potato pie, and, er, Lay’s potato chips) I had travelled during the Easter break from the University of Edinburgh, during the height of the Cold War, for a two-week cultural tour of Moscow and Leningrad. As you do. The trip was amazing and scary in equal measure. The latter courtesy of an emergency hospitalisation due to a water-borne parasite, as well as being interrogated about my fellow tourists while lying in a skimpy gown attached to various machines (they thought someone was a drug courier). But that story is for another time. I had the borscht in our hotel. And no, that wasn’t what made me sick. The borscht was absolutely delicious. It was about the only thing that was however. That and the black chewy bread we were given at every meal. All other meals were variations on unidentifiable grey gristly bits floating in mystery broth. It was pretty horrid. We only had borscht the one time. I have always remembered the babushka who served us. It was the only time I ever saw her, and I think that she herself had made the soup. While everyone else looked at us depraved Westerners with a mixture of fear and envy, this tiny frail woman, whose wrists looked like they would snap under the weight of her cauldron, smiled twinkly as she carefully doled out soup to her indifferent, chattering guests. But after we took a sip we all fell silent. It was a special moment. This, the soup of kings and peasants, was a revelation. I suspect that if I had had the guts to follow this woman to the kitchen and indicated my pleasure I may have been rewarded with a seat at her kitchen table. I might have shared a meal in what would have been a cramped and steamy room in one of the anonymous grey high-rise monstrosities that blighted the outskirts of Moscow. But I didn’t. So this borscht. Although many of us think of it as Russian, or Polish, it may actually be Ukranian. It is thought that with many dishes, the country with the most variations and geographical tinkerings is the likely originator. And Ukraine seems to have the most. I am not a food historian so I won’t be too adamant but from what I have read I think this may be true. The borders in Eastern Europe have had their unfair share of redrawing, and its peoples scattered due to war and conflict. 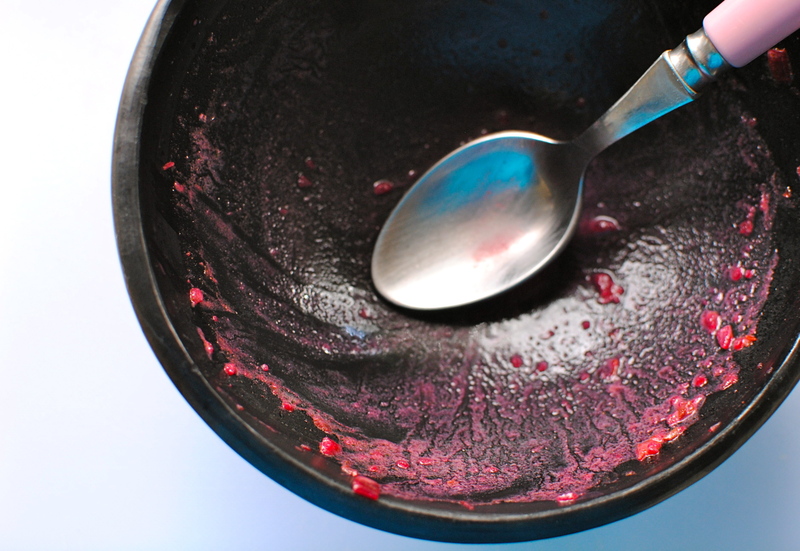 So, it is probably fair to say that the origin of borscht is equally divided and scattered. But it is such a fabulously giving and nourishing soup, with the scarlet beet at its heart, that it lives on in many kitchens across the globe. From high-tech stainless steel temples of cooking in richest Moscow, to pokey wee apartments in New York City, and in this rather tired-looking kitchen in Edinburgh: the heady fog of mulched and sweetly savoury vegetables simmering knows no borders. 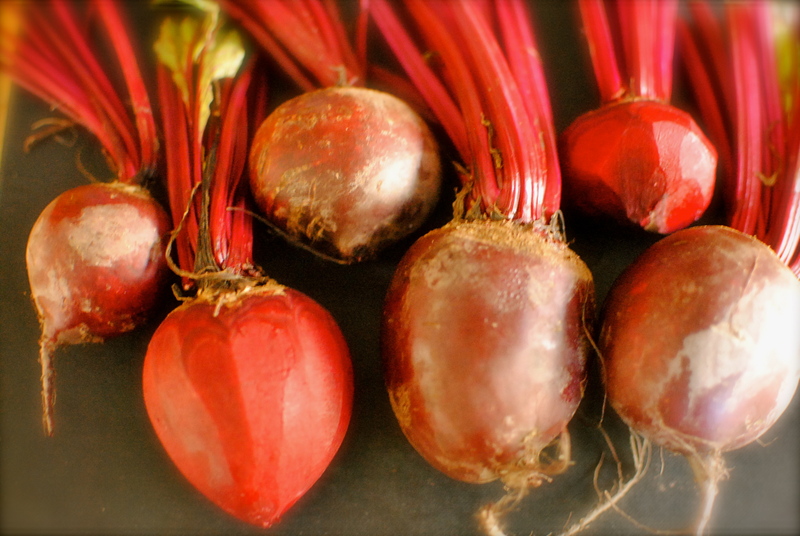 Nutrition bit: Known for its blood-purifying properties, beetroot has a fantastic disease-fighting profile. At its most basic level it enhances the manufacture of white blood cells, stimulates red blood cell production and improves supply of oxygen to cells. This last point is very interesting because a small but well-conducted 2009 UK study demonstrated beetroot’s capacity to boost muscle stamina, probably because of the abundance of naturally occurring nitrates. This may have implications for athletes as well as ordinary folk going about their daily business, especially those with respiratory problems as beet nitrate helps the body to better use oxygen by boosting blood levels of nitric oxide. I wouldn’t advise consuming the half-litre a day amount achieved in the study (potential side effects include hives and rapid heartbeat) as we can benefit from eating and drinking much smaller amounts, including lowered blood pressure. And don’t be alarmed if your urine or stool is pinkish or red. Many people are sensitive to the betalain and oxalic acid in beets and will experience ‘beetruria’, which looks scary but is completely harmless. From a cancer perspective beetroot may be useful as it contains a high amount of manganese, which is needed for the formation of the potent anti-cancer cell protein, interferon. The deep red colour is due to another nutrient powerhouse – betanin, thought to help prevent both cancer and heart disease. 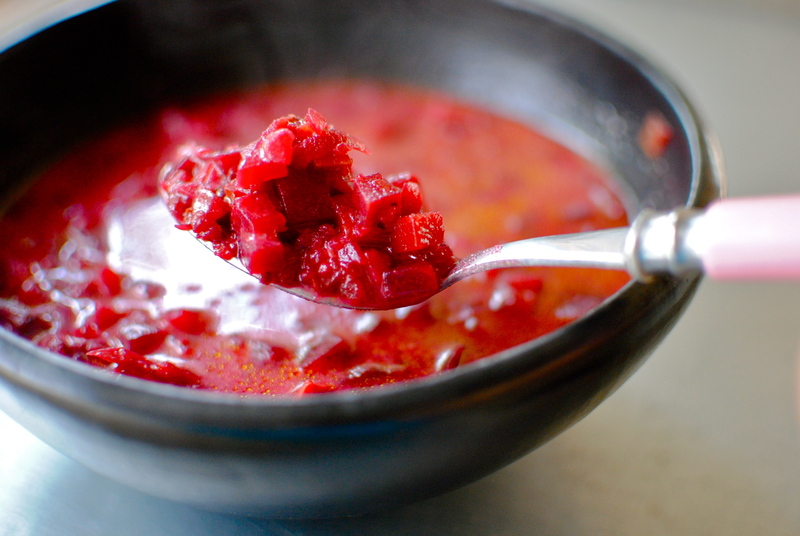 Originally borscht – or barszcz, as it should properly be called in Poland and Ukraine – was meat-based. Still is really but, like the boundaries of the countries where it is a lifeblood food, borscht comes in many permutations. Including vegan. I even found a recipe calling for such exotics as ginger and orange. But mine is a hodge-podge recipe, one where I have nicked elements from numerous sources to make my own super-healthy version. I relied a lot on this article in the Guardian, as well as recipes like this from polishplate.com. My version is in no way authentic, so please don’t write in berating me for including paprika (which I love), pomegranate molasses and kasha, or excluding lima beans (which I hate) and tomatoes. Feel free to adjust the recipe to your more authentic tastes or the contents of your larder. Soup is like that. Forgiving. 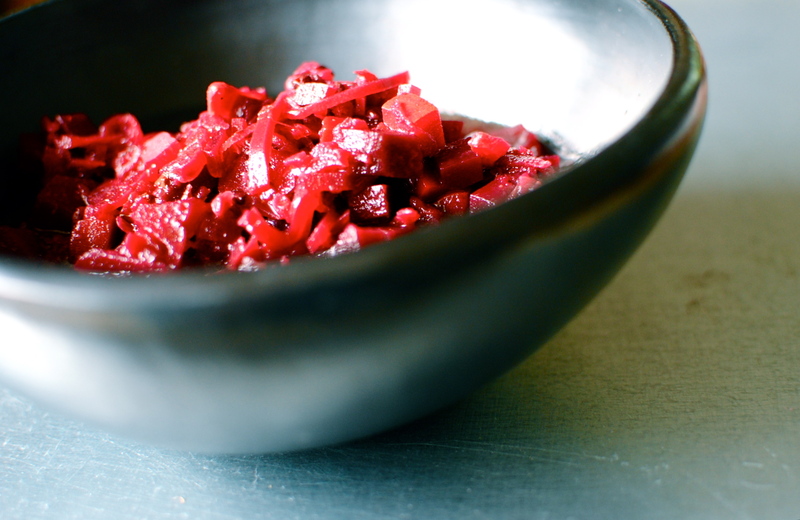 Finely dice three of the beets, finely grating the fourth and putting it aside for later. Heat the oil in a large pan then sauté the onion until softened. 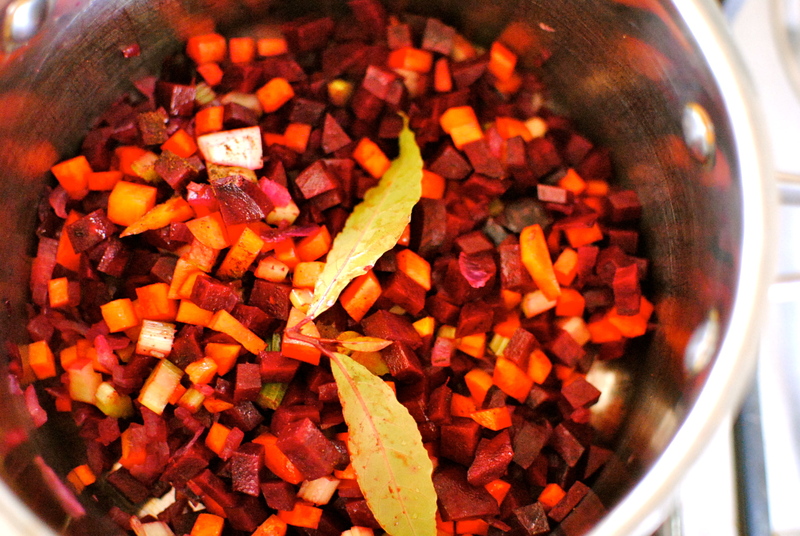 Add in the carrot, garlic, celery, diced beetroot, allspice, paprika, kasha and bay leaf. Stir and gently sauté for five minutes, covered. Add in a little stock if it looks like it may stick. After five minutes pour in the stock and add the potatoes; simmer for 10 minutes. Add the shredded cabbage and the grated beetroot, cooking for a further 10 minutes. When all of the vegetables are tender, stir in the honey and vinegar/pomegranate molasses. Check the seasoning and maybe add some salt and pepper, or perhaps more vinegar. Serve warm with a spoon of sour cream and dark rye bread. This soup tastes even better the following day, and freezes beautifully. To make it more of a meal, add some cooked white beans. The kasha is something I haven’t seen elsewhere but it adds a little thickness and starchy goodness, especially if you are using new potatoes, or no potatoes. Serves 6-8. Freezes very well. My mouth was seriously watering as this post popped up with the beautiful picture. 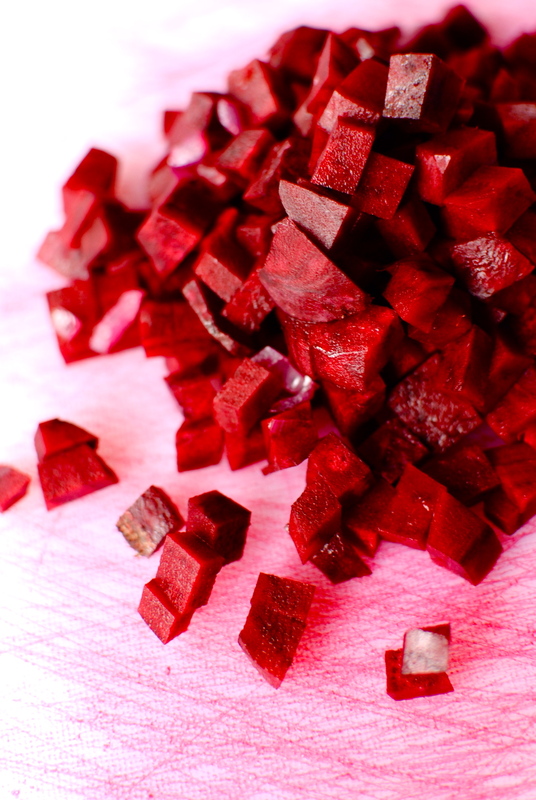 Maybe because I love beets, but maybe because I’m 50% Ukrainian! This is right up my alley. Thanks! So glad you’re liking the serum! 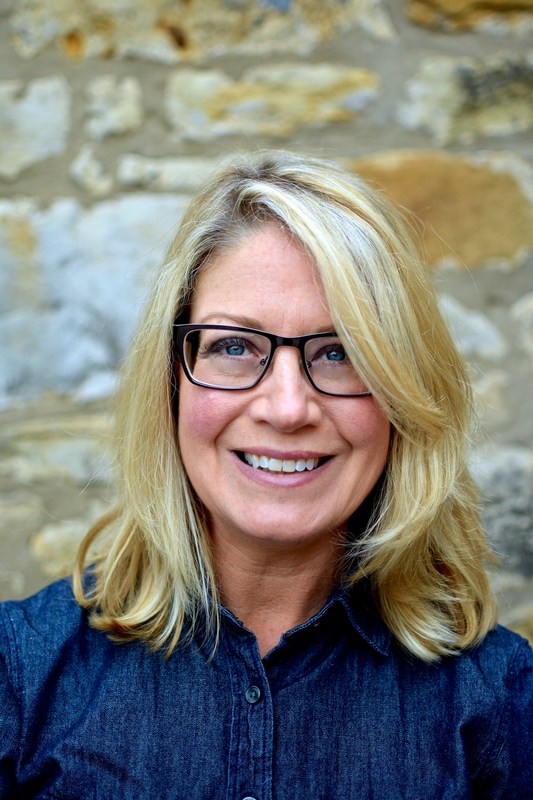 Kellie – I loved the story that went along with this beautiful dish. I’ve heard the name before, but have never seen anything so delightful-looking! We are huge beet-green eaters, and usually just roast the root to top salads. I will bookmark this to my recipes folder for sure. With cabbage, potato, cider…just looks too yummy to pass up! I’ll let you know when we cook some. Thanks so much for sharing. PS – I have a Ukrainian friend I will pass this to! I’m glad you already love borscht. I was reluctant about posting this as I thought I might be met with silence or ‘ugh’. 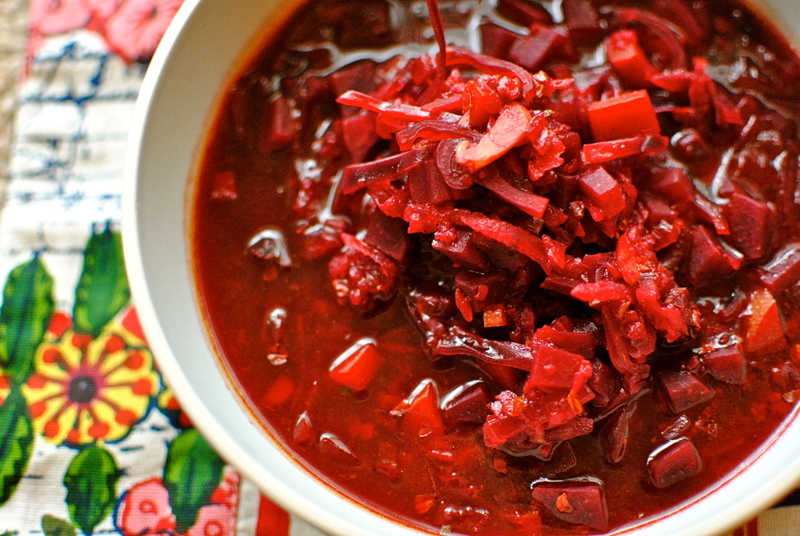 Borscht is wonderful in all it’s different forms. How can it not be? Where do you live? What is your favourite dish from your country? This is stunning, the colour is so beautiful! I need to include more beetroot in my diet I hardly ever buy it, but that is going to change now thanks to you, expect an increase in bright pink food in the future and I call my cat Anouschka Babouschka so it is meant to be!! Thank you so much for this post! I am such a fan of beets, and all of my friends look at me funny whenever I eat them but I think they are delicious! Thanks for posting all of the nutritional information about beets so from now on whenever I get awkward stares at my dinner plate I can tell them why my beet loving taste buds are better than their judgmental eyes! hahaha. 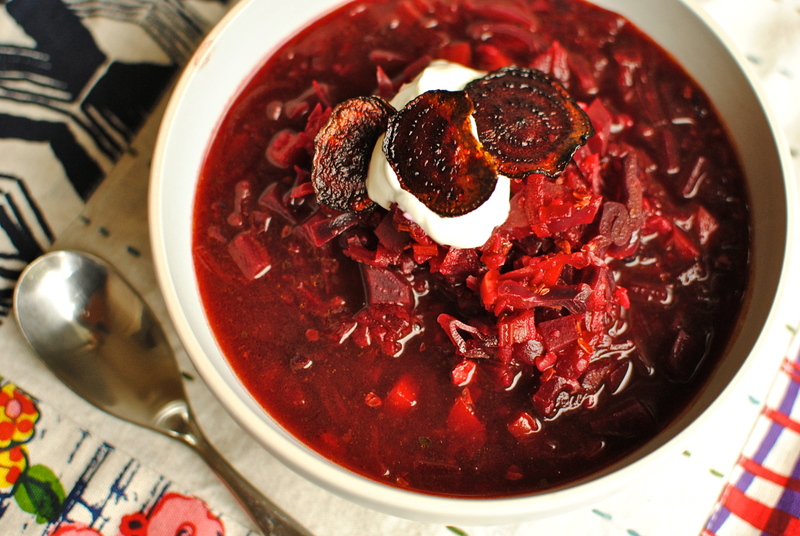 Ive also surprisingly never tried borscht before but now im going to have to! Thanks again for the post! Wow, what a story. I love eating food made by people who honestly put passion into what they make. (And the cultural tour sounds pretty amazing…such a rich history in that area of the world.) 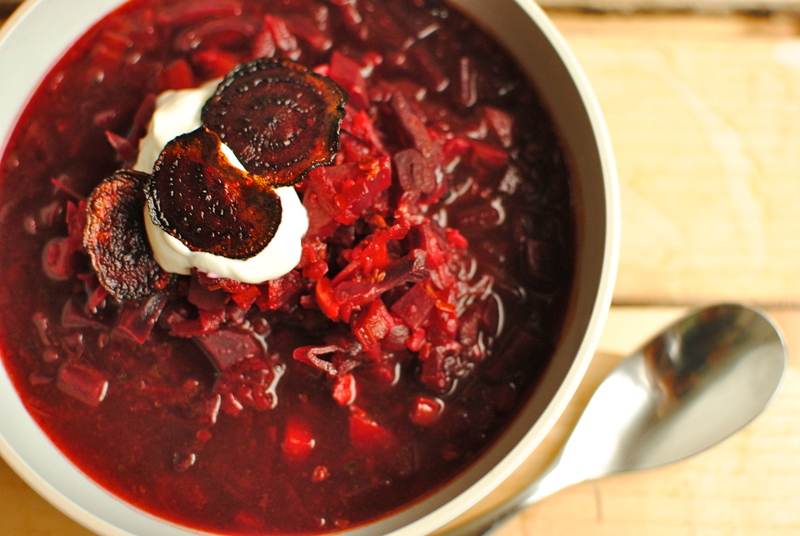 As for this gorgeous soup, I have been a huge fan of beets ever since I was a little girl. 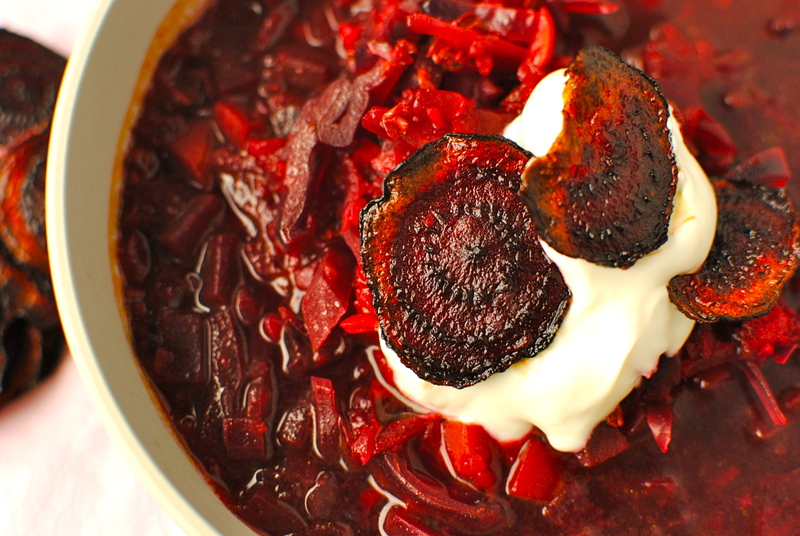 Love borscht, but never found a recipe I truly loved when making it at home. I need to try your version, it looks fantastic! Thanks so much for your kind comment. Passion in food can be found most anywhere and it is great to find it in unexpected places, and by seemingly unlikely folk. I do enjoy a nice bowl of hot borscht and some cheese at the bottom. I lived in a town during high school that was settled by Russians. It was a scary experience to move to the small town and be an outsider within such a tight community but what got me through it was the food! Food gets me through scary experiences, happy experiences, sad experiences. You name it really! What a great story! We visited much later, in 2006 and everything had changed. Probably not for the better for the babouskas whose stable lives had gone and many were reduced to begging outside the tourist attractions. Love beetroot. Yes, at least back then everyone had a job (however menial and sometimes ridiculous – the 3 counters one had to visit to buy anything, springs to mind). But I imagine most people would say that their lives have materially changed for the better. The woes they have will be ones that most of us in the West share. Any older Russians reading this care to comment? Great post! My mom always made Borscht growing up. Her family is Eastern European and it was just a household staple. They always topped it with sour cream but the beet chips sound awesome plus this is a much healthier version! Original borscht (ie the meaty kind) is pretty nutritious without me tinkering but I just thought change the fat, have less of it and add in kasha for a different fibre would make it more modern and a bit healthier too. I don’t think I could bear to cook down pork fat but `I imagine in a soup like borscht it would be lovely. I have cooked with Italian lardo in the past and it does contribute a lot to the flavour of a finished dish (it melts into it). But don’t think I would do that now. I prefer lighter tastes. Glad you like the sound of it Alyssa. I hope it brought back nice memories. Absolutely stunning photos – they might even convince my beet-adverse spouse to give borscht a shot (or at very least beetroot crisps). Those brilliant colors and that list of benefits has given me a yen for a bit beety goodness, which is fortunately available at any juice bar in Singapore in the form of ABC (apple, carrot, beet) juice. Kelly this looks delish! My veggie BF will love it. It was wonderful meeting you at FBC, hope you got back alright. Thank you Joanna. The train back up to Edinburgh was good but I was looking forward to my cosy bed. Really nice meeting you. I’ll have to have a look at your blog & be inspired by your photography. I read a lot about the history of barszcz and it was absolutely fascinating. I think most Eastern European dishes have many tales behind their places in peoples’ lives. I wish I had time to be a food historian and incorporate it into posts but my niche is nutrition so I will stick with what I (kind of) know. Hope you approve of the outre kasha and paprika. I actually prefer the barszcz without potatoes if I am using kasha. And, you are right, is incredibly meaty. Probs because of the umami-ness of the combined tastes. ← Squidgy Raspberry Brownies – a gluten-free treat!